Metformin is widely used for the treatment of type 2 diabetes mellitus. It is a biguanide developed from galegine, a guanidine derivative found in Galega officinalis (French lilac). Chemically, it is a hydrophilic base which exists at physiological pH as the cationic species (>99.9%). Consequently, its passive diffusion through cell membranes should be very limited. The mean ± SD fractional oral bioavailability (F) of metformin is 55 ± 16%. It is absorbed predominately from the small intestine. Metformin is excreted unchanged in urine. The elimination half-life (t1/2) of metformin during multiple dosages in patients with good renal function is approximately 5 hours. 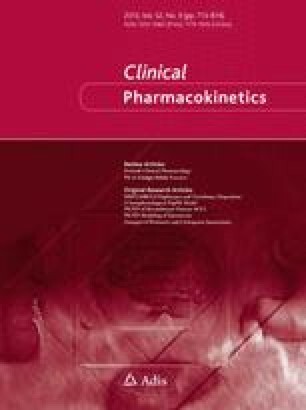 From published data on the pharmacokinetics of metformin, the population mean of its clearances were calculated. The population mean renal clearance (CLR) and apparent total clearance after oral administration (CL/F) of metformin were estimated to be 510 ± 130 mL/min and 1140 ± 330 mL/min, respectively, in healthy subjects and diabetic patients with good renal function. Over a range of renal function, the population mean values of CLR and CL/F of metformin are 4.3 ± 1.5 and 10.7 ± 3.5 times as great, respectively, as the clearance of creatinine (CLCR). AS the CLR and CL/F decrease approximately in proportion to CLCR, the dosage of metformin should be reduced in patients with renal impairment in proportion to the reduced CLCR. The oral absorption, hepatic uptake and renal excretion of metformin are mediated very largely by organic cation transporters (OCTs). An intron variant of OCT1 (single nucleotide polymorphism [SNP] rs622342) has been associated with a decreased effect on blood glucose in heterozygotes and a lack of effect of metformin on plasma glucose in homozygotes. An intron variant of multidrug and toxin extrusion transporter [MATE1] (G>A, SNP rs2289669) has also been associated with a small increase in antihyperglycaemic effect of metformin. Overall, the effect of structural variants of OCTs and other cation transporters on the pharmacokinetics of metformin appears small and the subsequent effects on clinical response are also limited. However, intersubject differences in the levels of expression of OCT1 and OCT3 in the liver are very large and may contribute more to the variations in the hepatic uptake and clinical effect of metformin. Lactic acidosis is the feared adverse effect of the biguanide drugs but its incidence is very low in patients treated with metformin. We suggest that the mean plasma concentrations of metformin over a dosage interval be maintained below 2.5 mg/L in order to minimize the development of this adverse effect. Financial assistance was obtained from NH&MRC Programme Grant 568612, Australian Research Council Grant LP 0990670 and St Vincent’s Clinic Foundation Sister Mary Bernice Research Grant. Dr P. Timmins is an employee of Bristol-Myers Squibb Company, who market immediate-release and sustained-release tablets of metformin. All other authors have no conflicts of interest to declare.